The Château de Villandry is located in the small village of Villandry, in the département of Indre-et-Loire and south-west of Tours. In 1934 Château de Villandry was designated a Historic Monument. 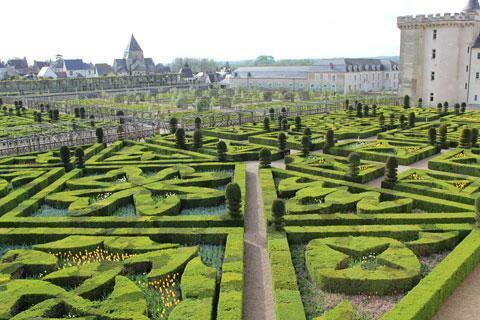 It also falls within the Loire Valley World Heritage Site. 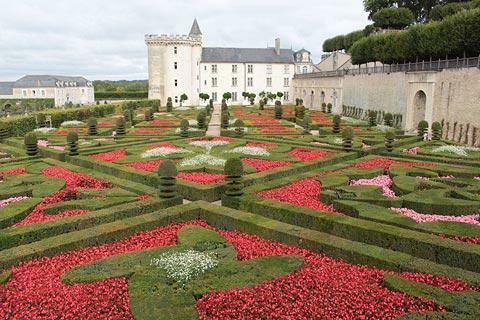 The castle at Villandry is one of the most impressive of the castles of the Loire Valley to visit, in part for the castle itself but especially for its very extensive gardens, the highlight of your visit and the main reason that people are attracted here. The interior of the castle also has some beautiful decoration and furnished rooms to see when you visit, including the dining room and kitchens. 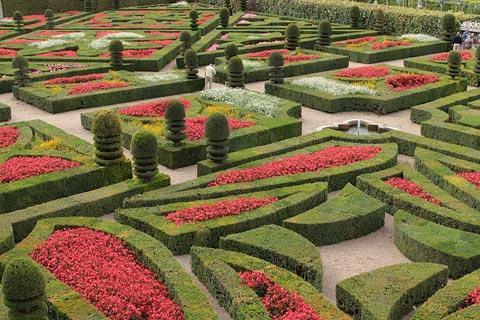 France This Way comment: until we visited the gardens at the Chateau de Villandry I always thought French style gardens were a bit too formal to be interesting - we were wrong! 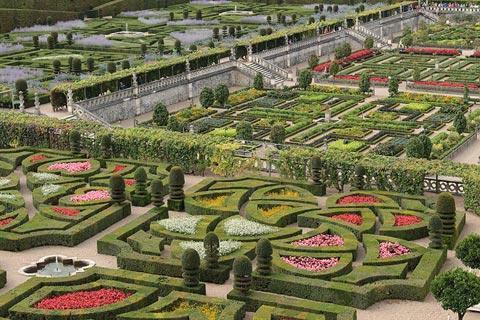 The Villandry gardens are perhaps the most beautiful I have seen in, enhanced further by the sheer size of the gardens and the belvedere that allows visitors to look across the gardens in their entirety. 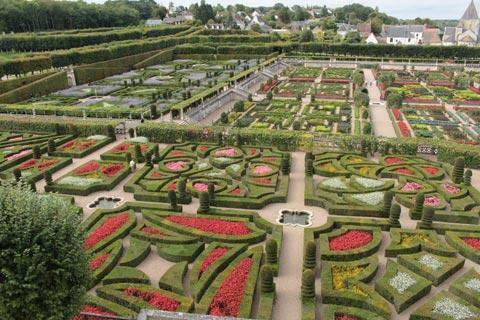 The lands where Villandry stands once held an ancient fortress in a region known as Colombier. It was here that King Philip II of France once met Richard I of England (“Richard the Lionhearted”) to discuss peace. The land was acquired in the early 1500’s by Jean Le Breton, France’s Controller-General for War under King Francois I, and a new château was constructed around the original 14th-century keep and completed in 1536. The castle remained in the Le Breton family for more than two centuries until it was acquired by the Marquis de Castellane, who made substantial additions to the building and also furnished it in a comfortable 18th century style. Three decades later during the French Revolution the property was confiscated and in the early 1800’s Emperor Napoleon acquired it for his brother Joseph Bonaparte. Over the next 100 years the castle was left to abandon and fell to ruin. Then in 1906 the castle was saved when Dr. Joachim Carvallo purchased the property and poured an enormous amount of time, money and devotion into repairing the castle and creating what many consider to be the most beautiful gardens anywhere in the world. 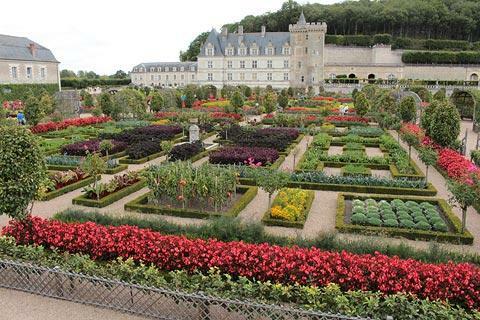 Still owned by the Carvallo family, the Château de Villandry is open to the public and is one of the most visited castles in France. 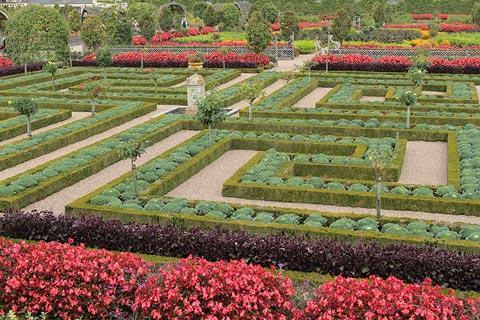 When you enter the gardens you first reach the vegetable garden where meticulous lines of vegetables such as beetroot, leeks and cabbages are planted in patterns within the squares formed by box hedges. 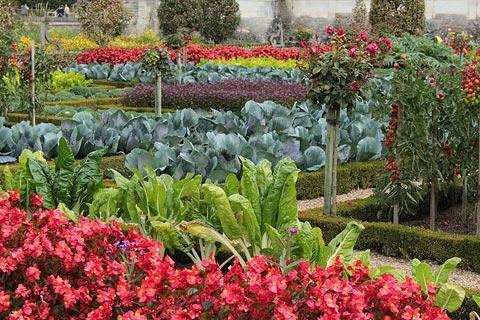 The colours are chosen carefully to create a remarkable canvas of colour and design and follow a historical tradition of mixing ornamental gardens with food production. 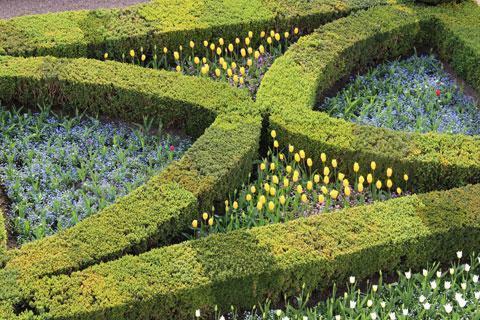 Next to the castle you can see the ornamental gardens, also with extensive box hedges surrounding flowers of various colours. 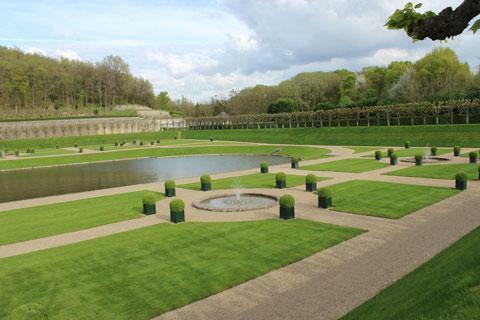 The best view across the gardens is from the raised belvedere next to the ornamental gardens: from the raised position you see the gardens as more of a pattern than individual plants, which was the original intention. From the belvedere you can follow a short walk through the woods that also has lovely views across the gardens and the village of Villandry. The water garden at the end of the path includes a pond area and fountains and is a peaceful contrast to the ornamental gardens. 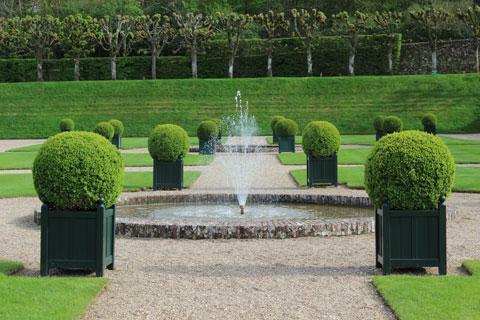 Although the main pond is based on the shape of a Louis XV mirror, the gardens are very modern in appearance. 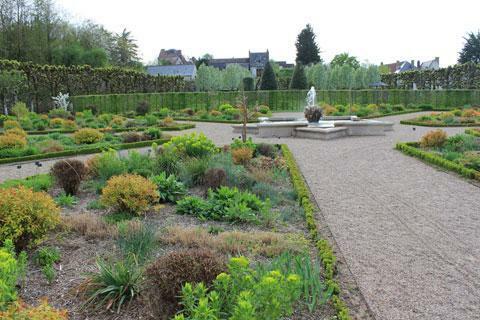 Next to here you can also discover the more informal gardens in the Jardin du Soleil. In the Sun Garden there are three distinct areas to discover: the cloud room with mostly blue and white plants, the sun room with orange and yellow flowers, and the Children's room with apple trees. 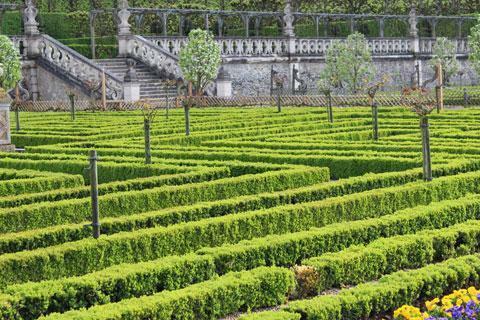 Next to the Sun Garden you can explore the maze. 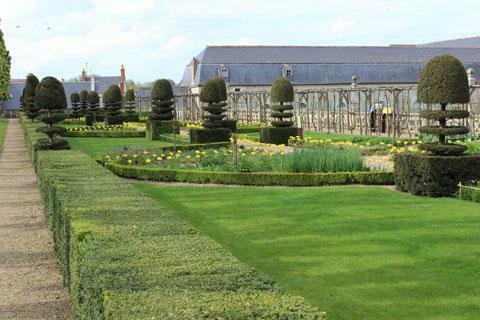 The last part of your tour of the gardens at Villandry is along the path through the Herb Garden, where herbs that were in common use in medieval times are grown. 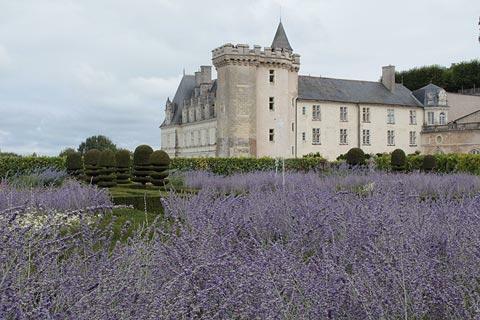 The castle was built in the early 16th century ans was the last renaissance style castle to be built in the Loire Valley. You can see the castle courtyard without entering the castle: the courtyard has galleries along two sides and beautifully decorated windows. The interior of the Chateau de Villandry, although less visited than the gardens, still has a great deal of interest. Most of the interior was redesigned in the 18th century and the furnishings are from this period. Highlights include the staircase and the beautiful mauresque ceiling in one of the rooms,as well as the views across the gardens from the castle keep. The castle and gardens are open all year round, admission price about 7 euros just to see the gardens or 11 euros to visit the castle and the gardens. The castle suggest that you visit two hours before sunset if possible, and we have found that May to September are rather more colourful than other times of the year. 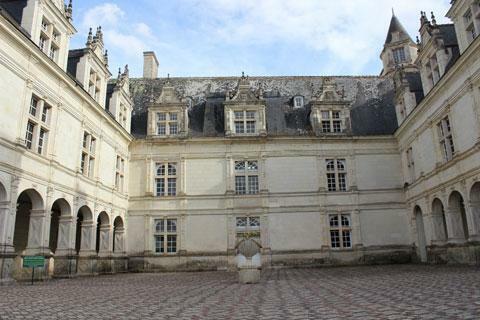 Close to here you can visit the Chateau d'Azay le Rideau, a lovely castle built on the river in the Italian style: note that the Chateau de Villandry was built about the same time, but in the 'new' French style. 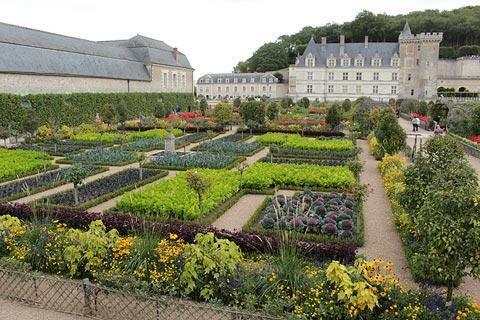 The village of Azay-le-Rideau is also pleasant to explore. 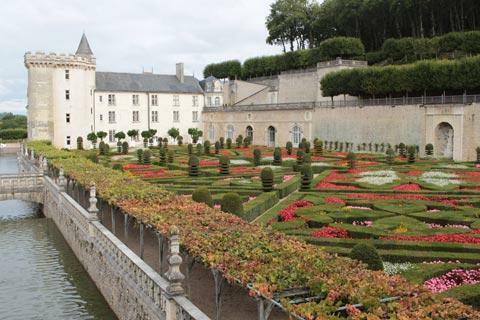 See more Loire Valley castles. To the north-east you will want to explore Tours, a town with a charming medieval centre and the impressive Tours cathedral and la Psalette cloisters.